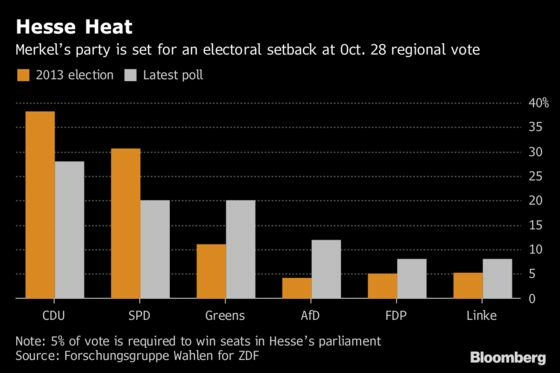 (Bloomberg) -- A German state election is putting Angela Merkel’s chancellorship on the line on Sunday as rarely before. Voters in Hesse, a state that includes the nation’s financial center of Frankfurt, are going to the polls amid public antipathy to the bickering coalition government in Berlin. It’s the last electoral test of Merkel’s standing before a Christian Democratic Union convention in December, where she’s likely to face unprecedented challenges to her leadership of the party. Polls suggest the CDU and the Social Democratic Party will slump to historic lows. A defeat in Hesse would inflame speculation about the staying power of Merkel’s national coalition with the SPD and, ultimately, the chancellor herself. With talk swirling in Berlin about options in a post-Merkel era, Sunday’s vote has national implications. Losing Hesse, where the CDU has governed with the Green party since 2014, could heighten the risk of a convention revolt against Merkel. Meanwhile, another post-World War II low for the Social Democrats might embolden those in the party who want to ditch Merkel’s government and regroup in opposition. If everything goes Merkel’s way, she’ll be re-elected in December to lead the CDU for another two years and oversee her fourth-term government until 2021. 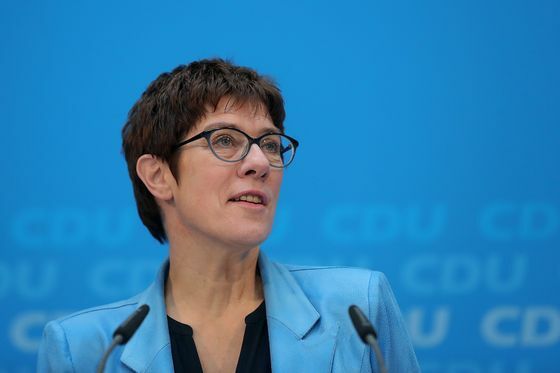 As the chancellor campaigned across Hesse, CDU general secretary Annegret Kramp-Karrenbauer raised the specter of instability and an early election if the national government broke up. “Nobody can say 100 percent how stable it will remain when it comes to the dynamic of the individual parties,” she told a rally. As in the Bavarian election on Oct. 14, the benefactors in Hesse are likely to be the Greens, now competing with the SPD for second place, and the far-right Alternative for Germany, or AfD, which poised to win its first seats in the state legislature. Declining support for Germany’s old-line parties and Merkel’s political vulnerability after the refugee crisis in 2015 and 2016 dogged her on the campaign trial, along with close-to-home issues such as diesel-car driving bans and rising rents. She asked voters to bear with her and go to vote. “I think we’ve understood the wake-up call,” Merkel told a campaign rally in Kassel alongside Volker Bouffier, the CDU state premier. The chancellor emphasized the positive results of her immigration policies in her weekly podcast on Saturday, stressing that refugees must respect German laws and values, and learn German. Ahead of the ballot, Merkel in effect threw open the race for her successor. For the first time, she rattled off names of possible contenders to take over the CDU, which she’s led for 18 years. 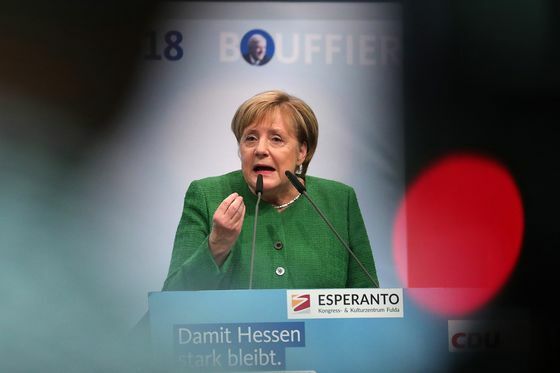 “All attempts by those in power to choose their successors have always completely failed -- and that’s a good thing,” Merkel told local broadcaster Hessischer Rundfunk.